I've described this house in this forum before, but only now am I getting around to sorting through my pics. I'd like to share some with you. This 1957 house has a surface-mounted meter on the outside. The service wires go straight out the back of the meter pan into the wall. These pictures show what's on the inside face of the wall. The cable - simple 3-wire cloth-covered Romex - pierces the wood sheathing without any bushing, and is anchored by a pair of bent-over nails. 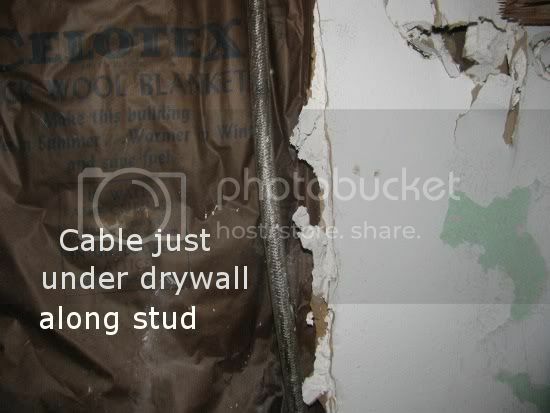 The cable passes through the rockwool insulation and runs inside the wall, between the vapor barrier and the drywall. It is directly under the 1/2" drywall, and runs along a stud. This wall was covered by 1/4" plywood paneling, held in place by 1-1/4" brads. 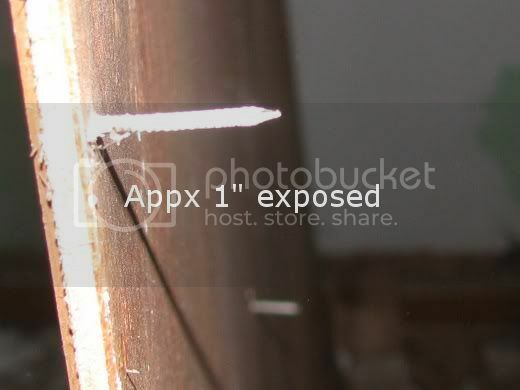 That is, 3/4" of each nail passed through the drywall, and had the potential to hit the cable. With the nails spaced all over the field - not just near the studs- it's something of a miracle that they missed all the wiring- let alone the service. I call the cable the 'service' as there is NO disconnect of fuse until after the wire has run from the meter, up the wall, across the ceiling, and down another wall to what was originally a 6-breaker FPE panel. One might say I have some objections to this rendering of the 'nearest the point of service entry' code requirement. I imagine that is actually the old style SE cable, Is the neutral separated strands wound around the ungrounded conductors? They didn't start using the plastic jacket on SE until about the same time it showed up on NM. I agree the workmanship is surprisingly bad for the old days. Guess that goes to show you that there were 'hacks' back then also! Yes, it is surprising. There is still a few services up here with the 'old' SE, tattered & hanging. I suppose some might want to ask: just how do you cut open a wall that you suspect has live wires right under the surface? There are a few ways. One of the best tools for this sort of job is the Fein Multi-master. With that tool you have an extraordinary amount of control, and you're not likely to nick the cable. I used a small, cordless 'panel saw' - a scaled-down version of a circular saw- to cut through just the wood paneling. I then made another pass for the drywall, with the blade set very shallow. 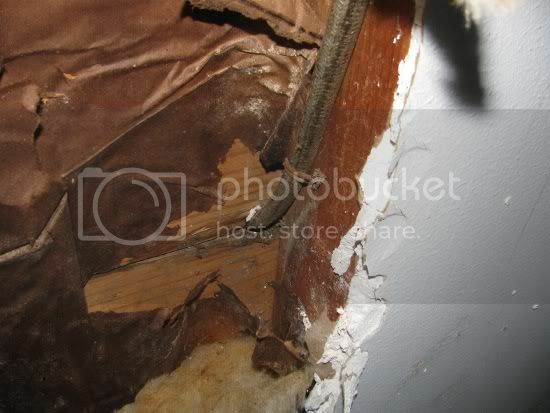 I then peeled off the paneling, and smashed through the drywall with a 2-lb. maul. "Safe" trumps "pretty" in this case. Another tool that really proved itself on this job was an air filter made by Shop-Vac. Looking like a small jet engine, it really kept the airborne drywall dust to a minimum. "just how do you cut open a wall that you suspect has live wires right under the surface?" The safety man may say that you should safe-off the power! "The safety man may say that you should safe-off the power!" The irony is, of course, that there is no way to 'safe off' the power .... at least, not without involving the PoCo. That's the whole point of my complaint about this arrangement. Sure, you can wag your finger at the reckless disregard for life shown by this electrician .... but I can't help wondering about the guy who hung the paneling, and all those nails he put near the cable. I wouldn't expect him to know the cable was there- or that there was no way to turn it off. Same applies to the housewife hanging a picture. My comments were not meant as any insult toward you. Just making a point, I thought with tounge in cheek. No, John ... no offense taken! I've just had my fill of 'safety experts' and their office-born one-size-fits-all directives. I also weary at those who look at the code and debate the meaning of the word "is" in their quest to do as shakey a job as possible. I mean ... I'm not that smart, but ... doesn't it seem obvious that you really, really want to be able to turn the power "off?" Why must the code spell things like this out in down-to-the-last-screw detail? Do these guys need a law to remind them to tie their shoe laces? With services like this as the 'norm' around here, I really want to watch the inspector's reaction when I get the new service installed. Hell, he just might parade the local trades past for a guided tour ... once he revives! Likewise, I am surpprised at the resistance I get from my fellow sparkies when I mention I'm putting the kitchen on its' own sub-panel. "But you can get a big panel," they say. Sure you can ... but even that big panel is sized to fit between the same two studs, which means there is room for only about 16 KO's. Allow for the panel feed and the large circuits (range, water heater, air conditioner, dryer), and that's 11 KO's or 22 cables (doubling up). That makes for a lot of holes in the top plate, a crowded panel, and a real spaghetti fest in the attic. Sure, the house was built with six circuits - but there is no way it can be rewired that way! 1 bath, 2 kitchen, 1 furnace ... that's four required dedicated circuits right there. One way to get rid of services installed like the one above is to require every service to have a disconnect with OCP outside of the house. This way any wire that enters the house is protected. I don't know how many services we had to repair after the Telco guy drilled through the service cable. Which usually terminates within feet of the electrical service.